Em and Gina are hosting a potluck! There are a bunch of lovely people joining in and tons of delicious food being made. Check it out here and here! Are you guys a fan of potlucks? I love having a bunch of people coming together and bringing out their favourite dish. There’ll inevitably be too many desserts (which is always a good thing) and usually, at least in the case of the potlucks that I’ve been to, the oven will be overstuffed with people trying to warm their dishes at the last minute. The solution? Bring something that doesn’t need to be warmed up in the oven. 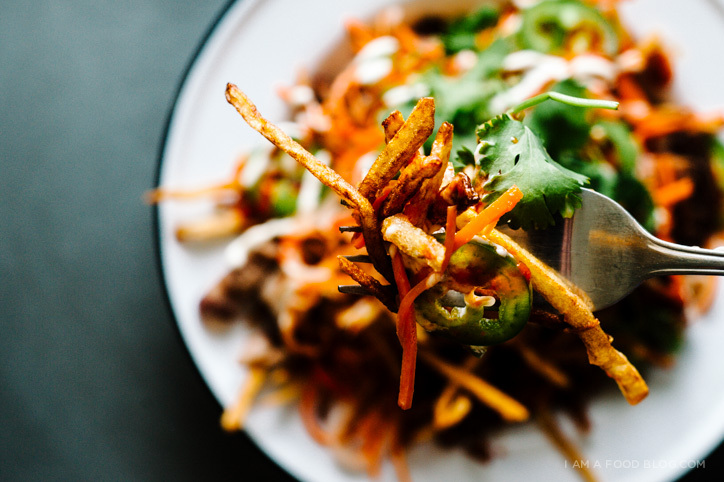 Of course, you could go with a lovely cold pasta salad or a fancy deviled egg, but if you’re anything like me, you’ll bring over all the fixings for banh mi fries. I guess the flaw to bringing fries to a potluck is the fact that you’re going to bust out your host’s deep-fryer (or pot). But I’m pretty sure they’ll forgive you when they dig into these fries. 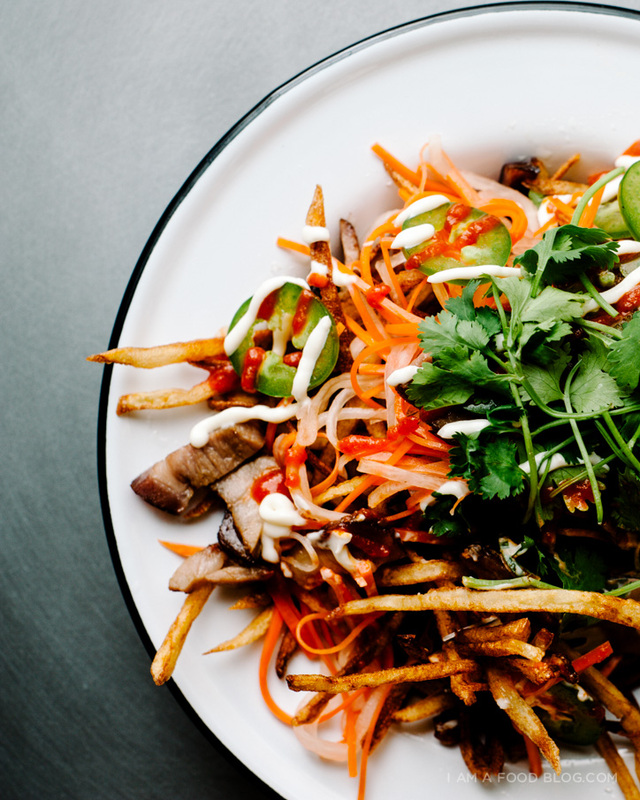 Crispy, crunchy and topped with everything good inside a banh mi, these fries are fusion (ugh, does anyone else dislike the word fusion when describing food? But what else do we call it?!) food at its best. Of course, if you’re totally averse to deep frying at someone else’s house, you can make this dish completely with store bought goods! All you have to do at home is make the pickles, slice up some jalapeños and wash off and chop some cilantro. Stop by your favourite Asian barbecue place and pick up some barbecue pork, then drop by your favourite fast food french fry joint, squirt on some kewpie mayo and sriracha and your dish is done! What’s your go-to dish for a potluck? 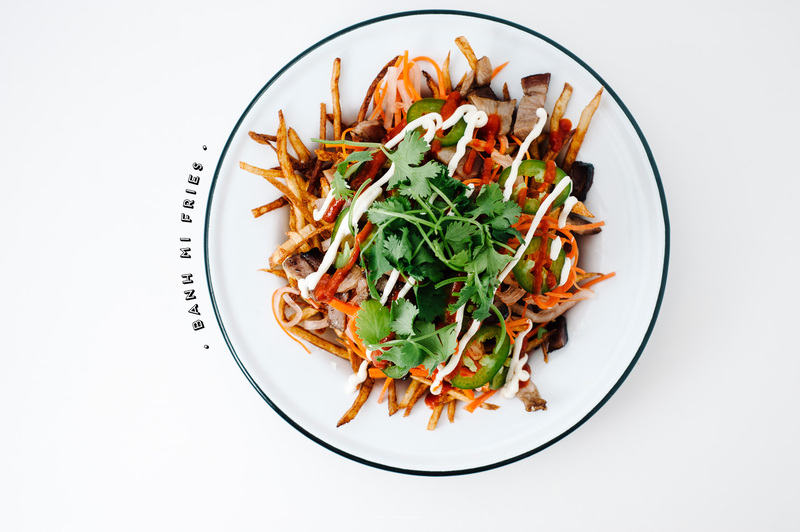 I’ve never actually brought these banh mi fries to one, but if you invite me over, consider yourself warned, I’ll totally do it! Hope you guys have a lovely weekend filled with food and don’t forget to check out the rest of the So Let’s Pig Out dishes here and here! Slice the potato into thin matchstick fries, about 1/8 of an inch thick. 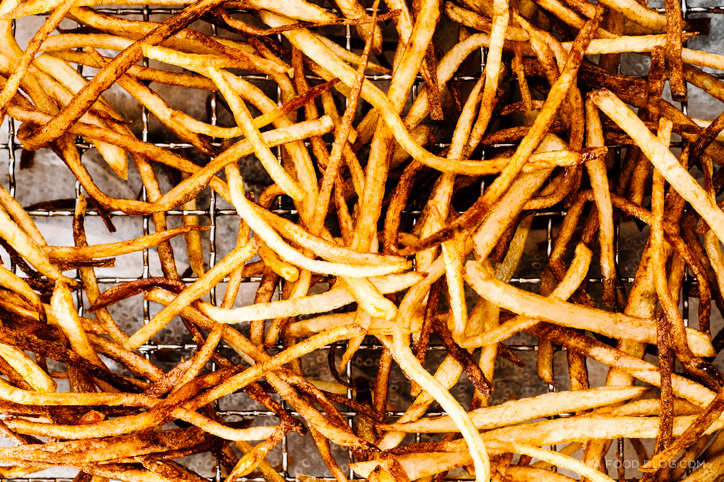 Soak the fries in ice water for 20 minutes, swishing every so often. Rinse in cold water and pat dry before deep frying. 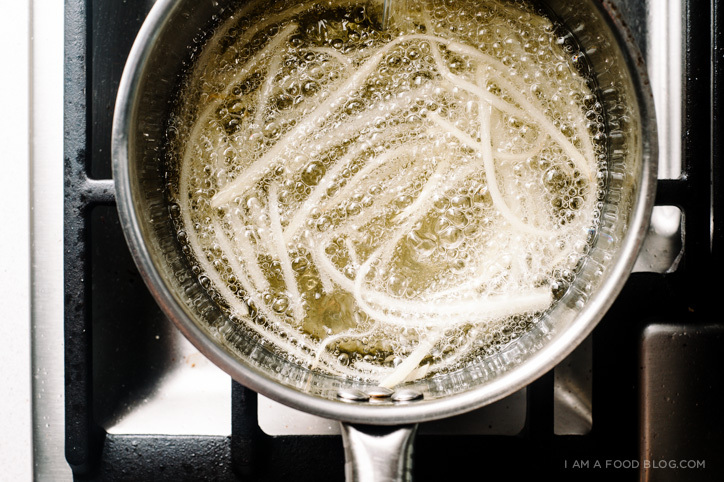 Over medium high heat, heat up an inch of oil in a deep sided pot until it reaches 350°F. Set up a wire rack inside a rimmed baking sheet. Gently drop in a small amount of the fries, being careful not to crowd the pan. Be careful – these fries have a tendency to bubble up! Use a slotted spoon and stir every so often to ensure even browning. When lightly golden, about 3-5 minutes, remove from the oil and drain on the prepared rack. Continue until all the fries are cooked. Bring the oil temperature up to 375°F and drop the fries in for another dip in the oil, until they are deeply golden brown and crunchy, about 1-2 minutes. Drain and season with salt and pepper. Top with barbecue pork, pickled vegetables, jalapeño slices, kewpie mayo and sriracha. Enjoy immediately. PPS – Here are all the links (think of it like a virtual potluck table)! Whew! Hope I got everyone! I loooooove potlucks! It’s so fun to see what people choose to make! This is such a yummy recipe I could scream! Plus, I learned something – I never knew which oil was the best for frying, but I’ll try grapeseed next time! Pot lucks have always been a treasure trove for deliciousness and meeting new people. I can not wait to see the party you guy put together. These are insane! I need this for dinner tomorrow night they are that temping. SHUT YOUR MOUTH. this is the most insane thing ever. just posted my friday links, but i am opening that thing right back up to add these. holy crap, i am coming over. OMG this just blew my mind. And I need a bucketload. AHHHHH!! Man, this is the best thing to happen to the banh mi since the banh mi! i legit didn’t even know how to properly fry a fry before this. 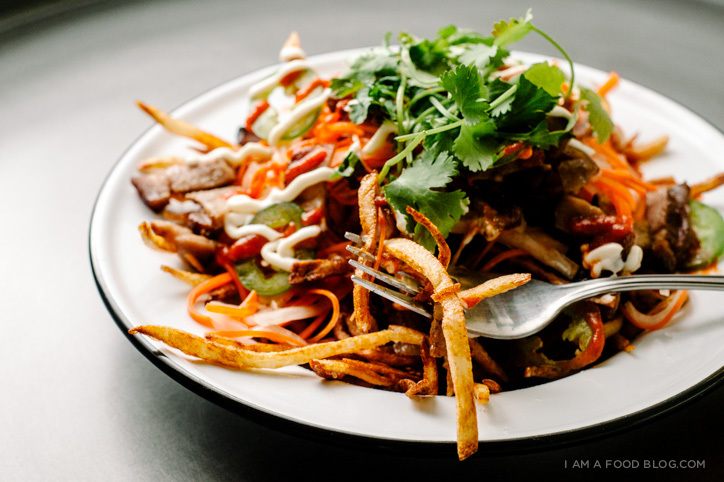 or how to properly pile my fries with pickled veg and sriraracha mayo. life changer. OMG this is KILLING me. I kinda want to just dive face first into this plate. And DUH I say a very loud YES to a french fry book!! YUM!!! Wow these look incredible! The first time I had Banh Mi was the Nom Nom truck, a food truck in LA, and I fell in LOVE. But on fries?? Pure genius. Your photos are gorgeous, so glad to have “met” you at the Potluck! Hello Canadian friend! :) You are brilliant. No surprise there, but seriously these fries?! You totally killed it. This is GENIUS! I might do it with oven-fries! Not as delicate, but still awesome. Love those flavors! Potlucks were big at my church growing up…. LOTS of casseroles, lots of Crock Pots, lots of Jello salads. So fun to do a virtual one! And I totally showed up at a friend’s house the other day and said, btw, we’re deep frying cheese curds! The resulting deep-fry-everything party was soooo much fun! I refuse to look anymore…been ooooogling all morning. Best idea ever!! Just stop..
oh my gosh – so many delicious recipes to check out!! these fries sound ahhhmazing!!! hope you have a great weekend! But yeah a fries book definitely has potential. There are so many different variations you can do on this. Cheers! Thanks for the holla and wow this looks so yum. On my list fo sho! STEPH – YES. I want to plant my face in this bowl of crispy, fresh delicousness! As soon as I saw this recipe on the sign up sheet, I was psyched! IT’S AS GOOD AS I IMAGINED! Get out of here or actually please come over here with a GIANT plate of these!!! So awesome. So excited to make them! ok this is a pretty awesome idea, i can never pass up a good bowl of fries. i am hands down interested in a french fry book.. the question is – will you write one! wow. Way to make food look so magical! I love the uniqueness of this recipe!!! Thanks for hanging out for the potluck, you pretty talented thing, you. whoa. whoaaaaaaaaaa. 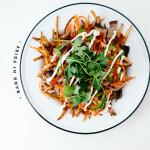 bahn mi + fries?? smartest ever! I want your french fry book! !